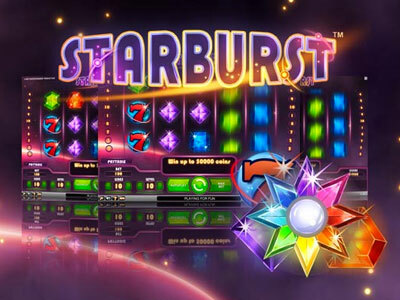 Starburst is a very popular slot game from the Swedish game developer Net Entertainment (also known as NetEnt). The slot was released in January of 2012, and has since then had a major impact on the online casino world. Starburst is a slot with a sci-fi, minimalistic and futuristic theme to it. The design is all about stars and a shiny outer space atmosphere. The slot is very much centered around the unique Wild symbol feature, sometimes called the ”Starburst-Wild”. When the Wild symbol appears on one of the slot wheel positions, it will expand to cover the whole wheel. Starburst has 5 wheels, 3 rows and has a maximum of 10 paylines. The slot has a background of a dark vast outer space. A few small stars are moving around in the background and a planet is visible. The graphics of the game itself and the slot symbols are very well developed with rich and sharp graphics. Constant animations of the background, symbols, turning wheels and possible winnings make the game feel very much alive and exciting to play. The Starburst symbols are mostly shiny stones/jewelry in different colors, as well as a symbol of the classic BAR symbol and the number 7. These last two symbols will get you the biggest winnings in Starburst. The Wild symbol looks like a bursting star (of course, it´s Starburst after all), and this symbol can get you really big winnings together with other symbols. The sound in the game is very futuristic and synth-based. The music helps the atmosphere of the game to feel calm and enjoyable. When there is a winning combination of symbols, the music picks up and sci-fi inspired sound effects make the pulse go up a notch. When the Wild-symbol appears the music and sound effects gets really exciting and this is a real good adrenalin kick. NetEnt has really managed to deliver well in both graphics and sound in the slot game Starburst. The Wild symbol in Starburst is really what this slot game is all about. This Wild symbol is made of a star in the many colors of the rainbow. This Wild symbol is not like in most other slot games. Instead of a “normal Wild” it will spread out to cover the entire wheel where it first appeared, and then give the player an extra spin. The Wild symbol can replace any other symbol to create paylines and winning combinations, and it can only appear on wheel number 2, 3, and 4 (not 1 and 5). If you get a Wild symbol on any of these wheels, the whole wheel will be covered with Wilds, and a new free spin is directly starting. If you get another Wild in any of the remaining wheels (2, 3 or 4) this wheel will also be covered, and a new free spin will start. This is called an Expanding Wild. If you get all the three Wild symbols on the three wheels at the same time, you will most likely win big! Another bonus feature in Starburst is a feature called “Win both ways”. This means that the player will win if a payline appears from left to right on the slot wheels (like in most slot games) but also if it appears from right to left. Starburst does not have any Scatter symbols or special bonus games with free spins like many other slot games, but the Wild symbol is instead loaded with special features in itself. Starburst has many positive features, for example the beautiful graphics, great sound and very addictive Wild-symbols and the Expanding Wild you can get there. On the negative side, Starburst does not have any other special bonus features except from the Wild symbol and the extra free spin you will get after an appearing Wild. When the sci-fi/space inspired slot game Starburst was released in 2012 from the game developer NetEnt it was instantly enormously popular among casino players. Starburst is a pretty simple slot game but it is still very well made and has beautiful graphics and a rich crispy sound. There is actually only one bonus feature in Starburst and this is the special Wild symbol that looks like a bursting star. If you get one of these symbols on wheel 2-4, you will get a free spin and the chance of an expanding Wild. Even though it is not much to have only one special bonus feature in this slot game, the Wild has an addictive experience to it that many players love. That is one of the reasons that has made Starburst so popular for such a long time.